Ta'n Shelgeyr Mooar ny Orion ny cho-hollys rollageagh. Foddee eh dy vel eh ny cho-hollys smoo scanshoil er feie ny cruinney. λ Ori (Meissa) kione y Helgeyr Vooar. 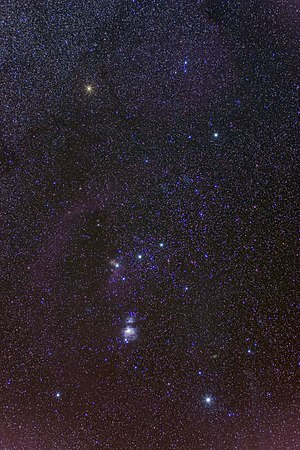 α Ori (Betelgeuse), er e gheaylin y jesh. Lesh crantessen ta ny smoo ny cruinlagh Mart, ta Betelgeuse ny rollage ruy. Dyn y wooise dy vel eh ny rollage-α, cha nel eh cho soilsheenagh as Rigel. γ Ori (Bellatrix), er e gheaylin y chlee. ζ Ori (Alnitak), ε Ori (Alnilam) as δ Ori (Mintaka): ta Cryss y Helgeyr Mooar co-yeant as ny tree rollageyn shoh. η Ori (Eta Orionis), eddyr Delta Orionis as Rigel. κ Ori (Saiph), er e ghliooney y jesh. β Ori (Rigel), er e ghliooney y chlee. T'eh ny rollage bane-ghorrym, kione jeh ny rollageyn s'gilley 'sy spoar. Ta tree co-heshaghyn echey ta neuakinagh veih'n Chruinney. ι Ori (Hatsya) ta ec baare Slatt y Ree. Ta tooilley coadanyn mychione y Shelgeyr Mooar ry-gheddyn ayns Wikimedia Commons.